FLUORESCENT lighting products and accessories. Made in USA by Techniquip Corp.
Our TECHNIQUIP fluorescent ring illuminators provide shadow-free diffused light which is excellent for inspection of surface mounted devices of dimensional products. The lights feature high frequency ballasts, ideal for video applications to prevent on-screen flickering. Made in USA by Techniquip Corp.
Fluorescent ring lights from Techniquip include the standard high frequency ballast for instant 'on', flickerfree illumination. Replaces TLC-5, TLC-7, TLC-8 models. All ring lights are available in ESD safe versions and universal power input options. Adapters to mount the Techniquip fluorescent and LED ring lights on all microscope makes and models. We offer the OEM quality replacement lamps for our TLC-5, TLC-7, and TLC-8 ring lights and illuminator systems from other manufacturers. 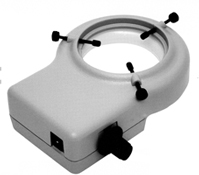 We also provide all other lamps for microscope and scientific systems at competitive prices and OEM quality.